Las Vegas is the trade-show and convention capital of the world and is home to three of the top ten largest convention centers in the United States. 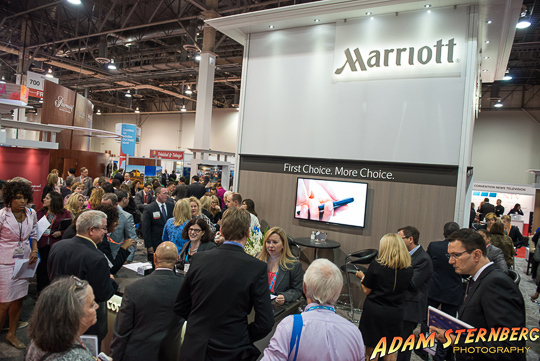 Over 5 million exhibitors and attendees conduct business in Las Vegas conventions every year with over 11 million square feet of meeting, event, and trade show space Las Vegas has been the ultimate destination for major business events for decades. The Las Vegas Convention Center has over 2 million square feet of exhibit space alone. 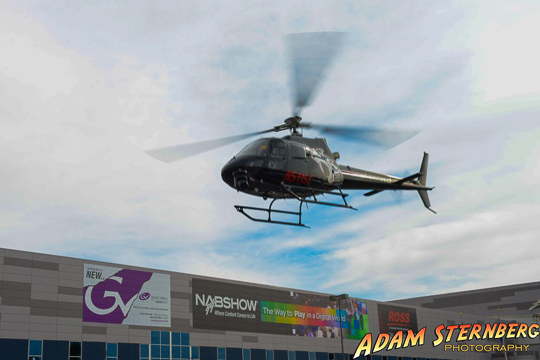 Some of Las Vegas’ larger conventions include exciting and well publicized events such as the Consumer Electronics Show (155,000 attendees), Automotive Aftermarket Industry Week (140,000 attendees), the National Association of Broadcasters (98,000 attendees), and many others. Other conventions, such as the World of Concrete event may seem less exciting but they still bring in over 50,000 people to Las Vegas helping to fuel our local economy. Throughout the year I am booked to photograph many of these different conventions, both big and small. 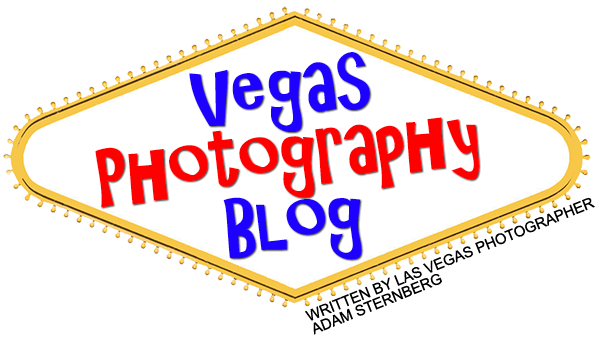 I’m frequently asked what it’s like to photograph at some of these events so I wanted to share what the experience is like to be a trade show and convention photographer. It never ceases to amaze me at how many different activities can be taking place at one time or throughout the sometimes multiple days of a large convention. To maximize the time at a multi-million dollar convention, organizers need to be as efficient with their time as possible knowing that many thousands of people will be in attendance. It is common at a major convention to have an exhibitor floor, keynote lectures, luncheons, and classes all taking place simultaneously. At night, after the convention floor closes, that can be where the real fun begins with corporately sponsored After Parties used to groom prospective clients or celebrate a new product launch. After Party at the Gallery nightclub for PC Gamer Magazine. They were hosting a special event during the Consumer Electronics Show of a new game roll-out and had devilish models posing with guests. To preserve these experiences of the convention itself, event management call upon one or more professional event photographers, such as myself, to capture the highlights. These photos can be used for everything from press releases to marketing materials to next year’s show. Occasionally I’m booked to shoot for the “Dailies”…the daily newsletters published by the event to highlight the previous day’s news and sometimes I’m hired to shoot for individual booths who want professional photos for their company prospectus or newsletters for their clients as well. 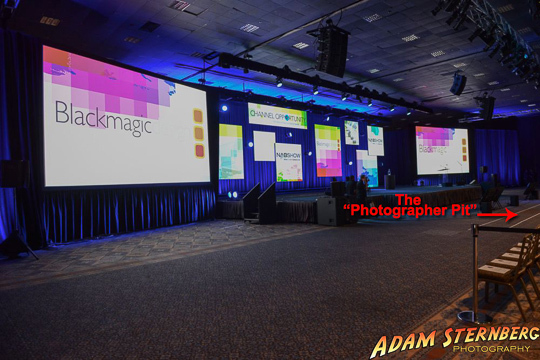 Typical Daily photos might be people interacting in a booth doing a product demonstration, busy aisles filled with attendees, or photos of keynote speakers. 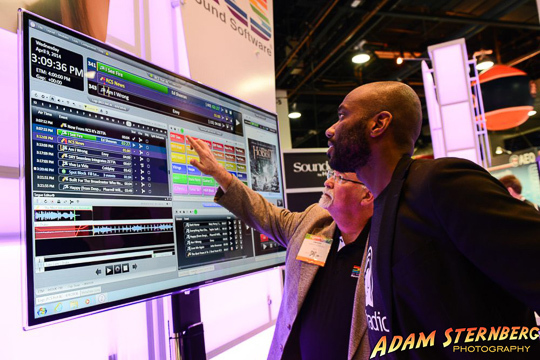 A company salesperson is demonstrating their latest editing software to a potential client. 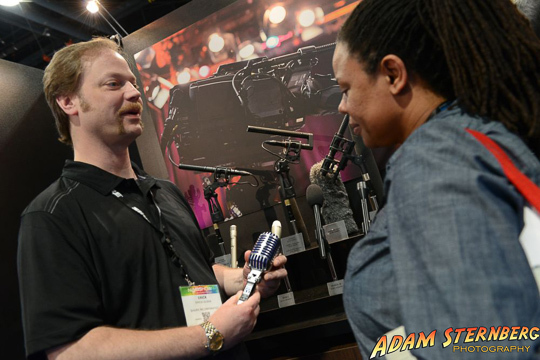 Discussing microphone technology in a trade show booth. Drone technology is now a very hot topic in broadcasting. 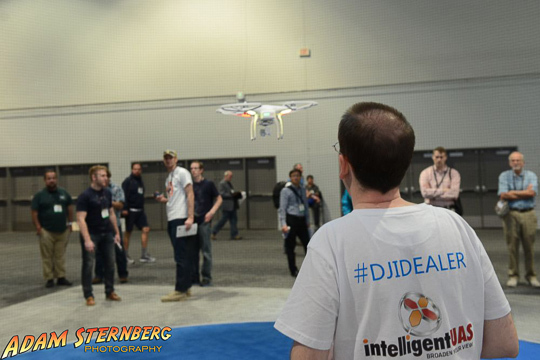 Here a company demonstrates one of their drones inside their booth. 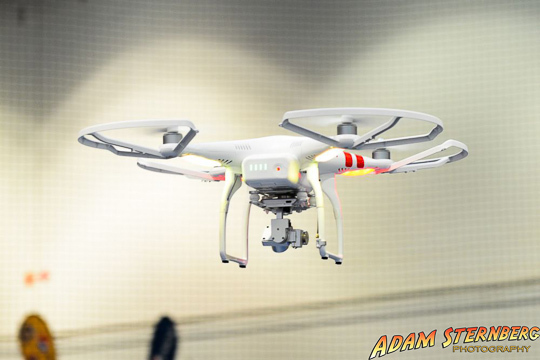 A drone shoots video inside a trade show booth at the National Association of Broadcasters convention. 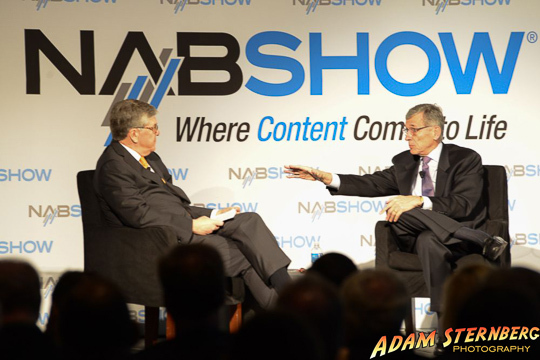 Here, NAB President and CEO Gordon Smith interviews the FCC Chairman, Tom Wheeler during a packed house keynote. 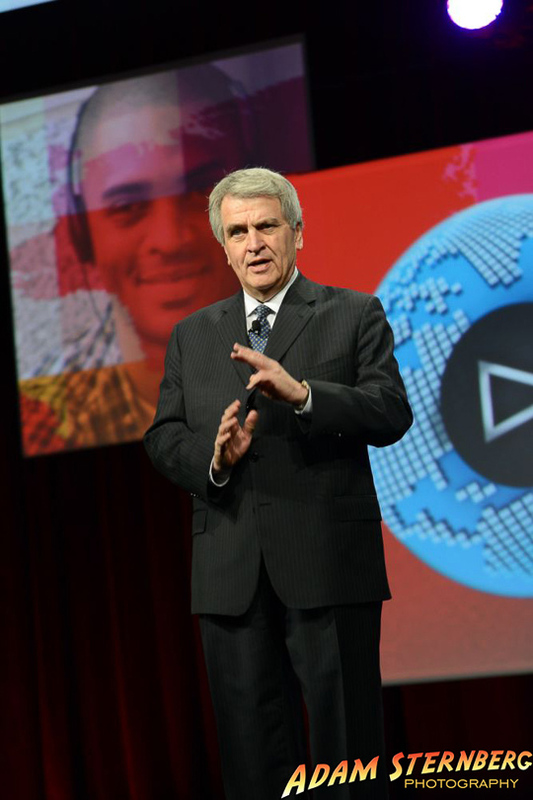 NAB President and CEO Gordon Smith welcomes nearly 100,000 attendees at the 2014 convention opening speech. While shooting these different events can be a lot of fun, such as when you are photographing “Booth Babes” (A “Both Babe” is a term used to describe promotional models at a convention or trade show. More often than not, they are young women wearing skimpy or revealing outfits with a company logo on it and are designed to interact with conventioneers to get their information for promotional uses or to distribute information about the company and its products or services) while other times you may have to contort yourself with your gear for many hours to get the best shots of keynote speakers or an award ceremony. Two girls representing the University of Nevada, Las Vegas duke it out in a boxing ring. The “Photographer Pit” is the area in front of a stage (sometimes taped-off as in in this case) where the photographers can kneel down to get photos of the speakers or entertainers on a main stage. It’s a great place for a photographer to skin their knees, scuff up their shoes, be uncomfortable for sometimes hours at a time, and also get the killer shots! 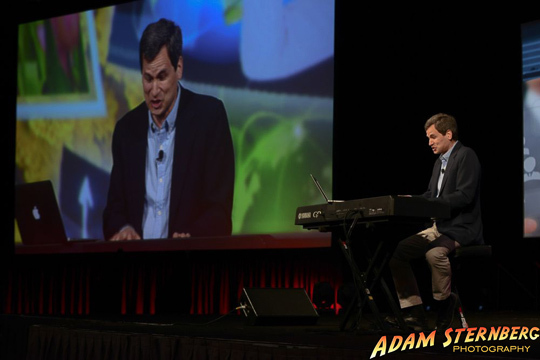 Photo of famous blogger and host of the PBS show Nova, David Pogue as shot from “The Pit” in front of an audience of over 1,000. 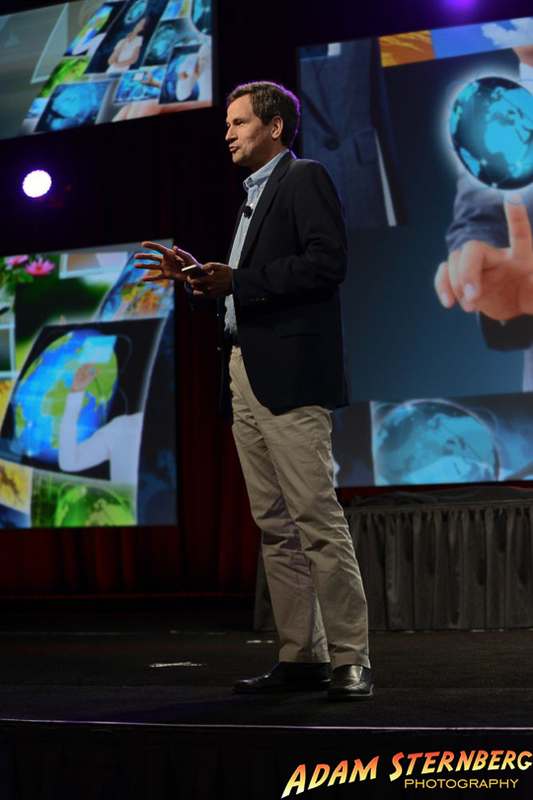 A wider shot of David Pogue on stage. This time with a photo of the live video of his performance behind him. 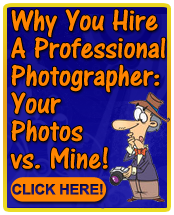 When I am booked to shoot an individual booth, there are even different things I can be requested to shoot. Sometimes it is shooting the empty booth before the trade-show even starts. Usually referred to as “Empties”, these photos are frequently used as reference for how the booth was constructed or they can be used to show the neatness of the booth before thousands of attendees pour through it. Sometimes booth photos are shot during peak times of the convention so a company can show how popular they are as exhibitors. As a method of getting attendees into their booths, some companies employ professional entertainers to draw attention to their booth. These might be celebrities, magicians, models, or even celebrity impersonators and I would be brought-in to take photos of attendees mingling with the booth entertainers. 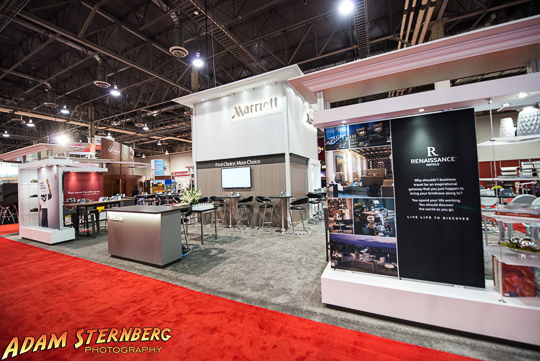 Once I was even booked by a Fortune 500 company to take photos of their competition’s booths at a major convention. I had to be a little covert at that one. :-). 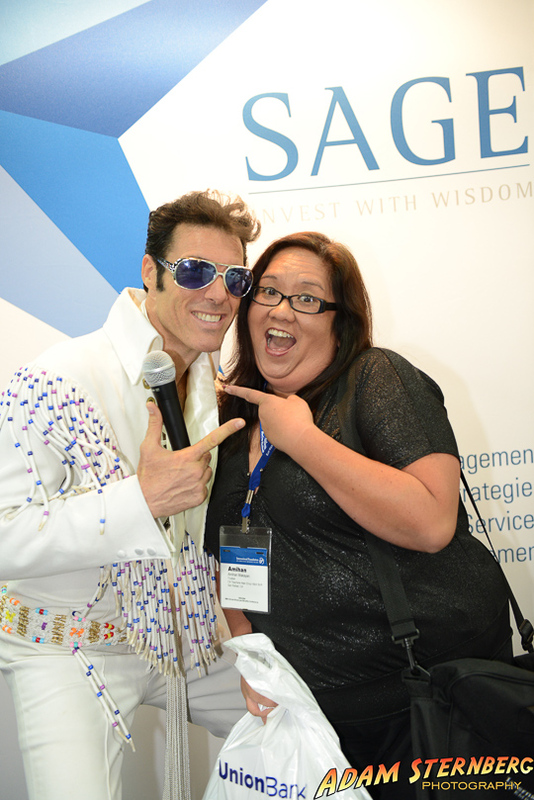 Photos of “Elvis” and attendees in the Sage Advisory Services booth at a recent financial expo. One of my clients is Marriott International. Here I shot their booth empty at a recent travel convention. Here is the same booth but now during peak hours at the same expo. 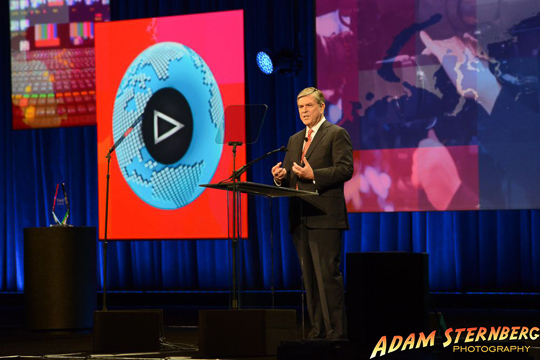 Most recently I was booked to be one of three official photographers to shoot the dailies for the NAB Show…the National Association of Broadcasters. 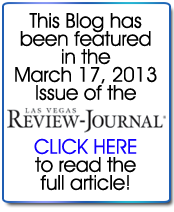 Now celebrating over 20 years of having this mega-convention in Las Vegas has grown in attendance every year with the most recent convention having over 98,000 attend. 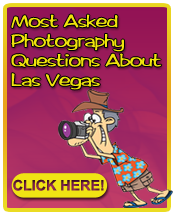 This convention is the third largest such event in Las Vegas consuming every square inch of meeting and exhibition space of the Las Vegas Convention Center and the adjacent LVH convention center as well. There were banquets, award ceremonies, classes, and hundreds of exhibitors showing the latest technologies in the world of broadcasting. 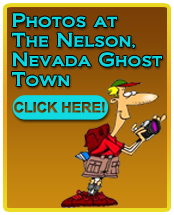 Many of the photos I shot were used on the NAB website and were also picked up through media outlets around the world. One of my photos even made it on The Today Show on NBC, which I was very excited about! 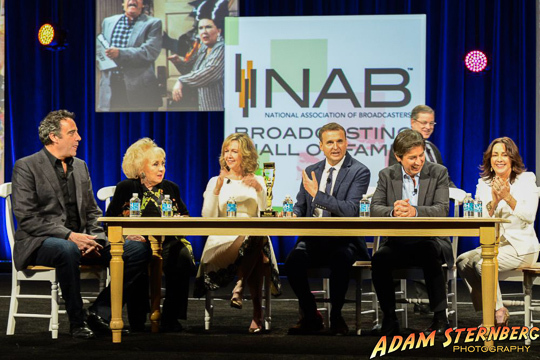 Two of my favorite shoots from the event were spending time with and shooting the cast of Everybody Loves Raymond and entertainer Steve Harvey, all of whom received Lifetime Achievement Awards from the National Association of Broadcasters. Not only were these celebrities a pleasure to work with, they were a lot of fun to shoot as well. 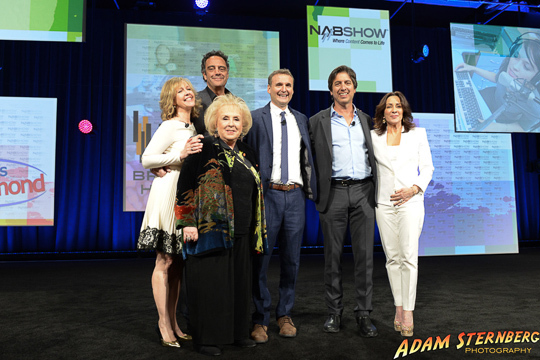 The entire cast of the show Everybody Loves Raymond, who were inducted into the NAB Hall of Fame. 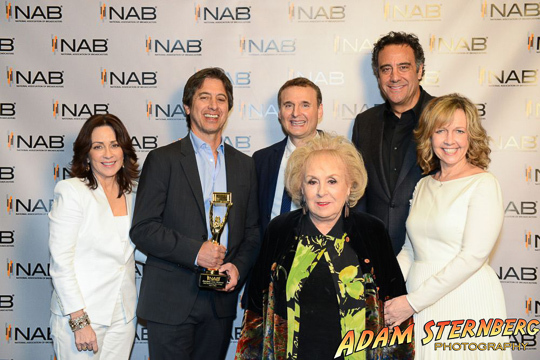 From left to right: Monica Horan, Doris Roberts, Brad Garrett, show creator Philip Rosenthal, Ray Romano, and Patricia Heaton. I had the opportunity to spend half of a day photographing them and it was a real pleasure to spend time with them all. The press photo of the cast after winning their award. As of the writing of this blog I have now seen this photo appear on over two dozen different websites and it was also shown on The Today Show on NBC! 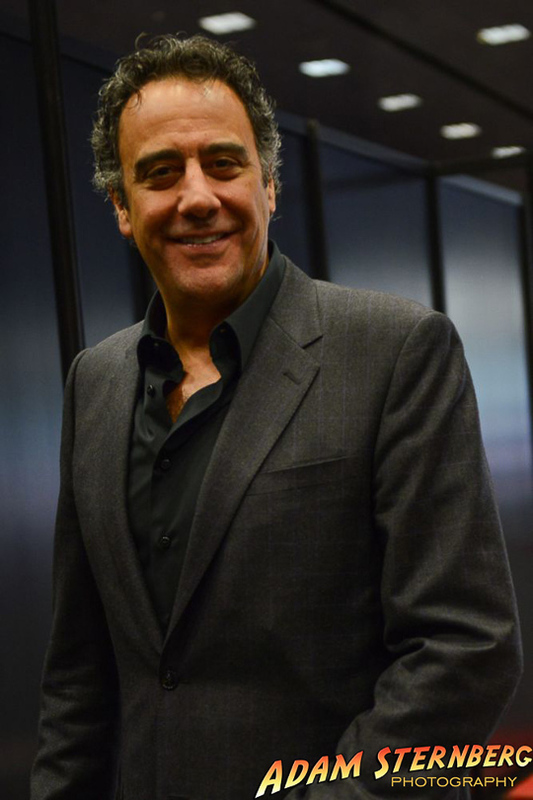 Actor and comedian Brad Garrett backstage before mingling with guests at a VIP reception. 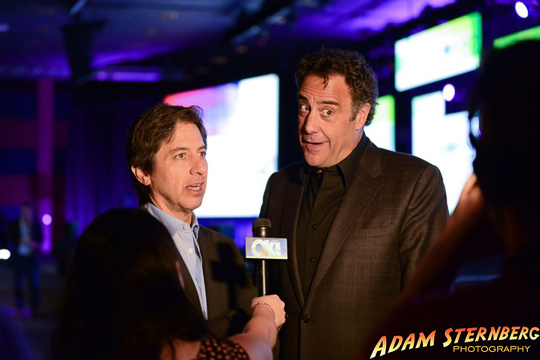 Photo of Ray Romano and Brad Garrett during an interview. Entertainer Steve Harvey at his NAB Award banquet. 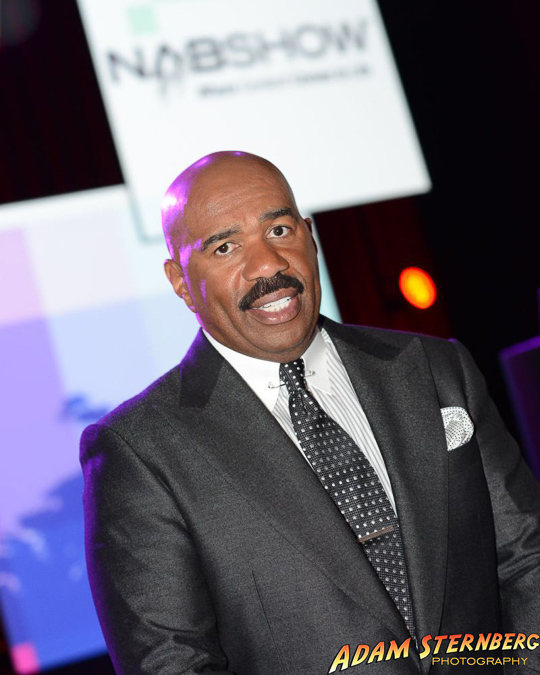 Steve was inducted into the National Association of Broadcasters Hall of Fame at this event. 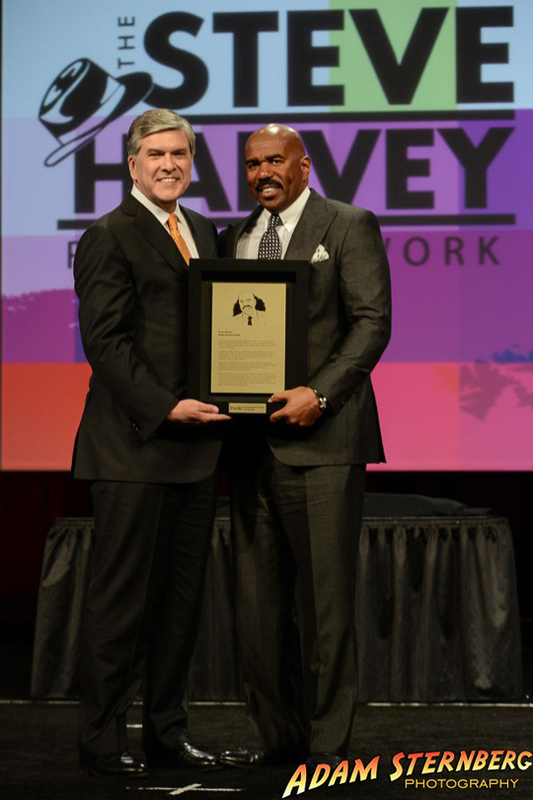 Steve Harvey receiving his NAB Hall of Fame award for 2014. 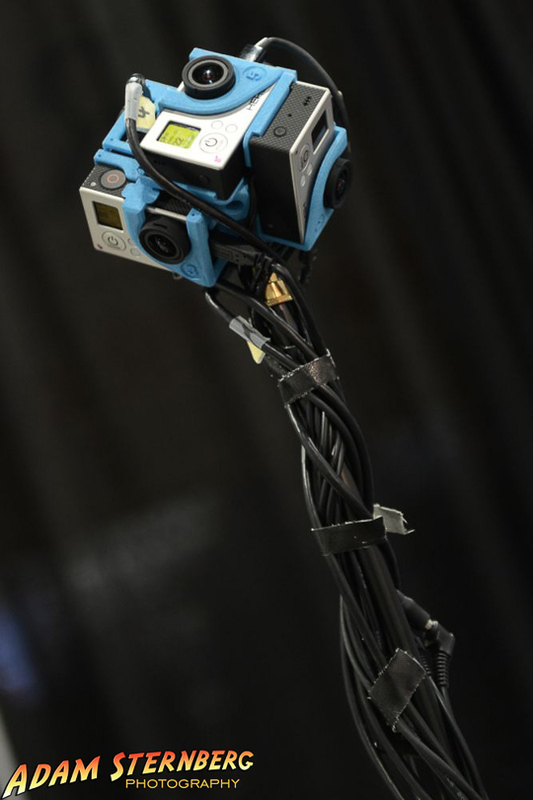 At some trade-shows, it’s all about the gadgets and gizmos. Sometimes the gadgets and gizmos can fit in the palm of your hand. Other times they fly in the air and have multi-million dollar price tags! Yes, this is actually a product demonstration taking place.